I am trying to work on a custom 50th birthday card, but the current Pals Paper Arts (PPA199) color challenge was swirling in my head. The colors are Calypso Coral, Pear Pizzazz, and So Saffron. Tulips and butterflies worked for me! There is a touch of clear Wink of Stella on the butterfly wings, a slight shimmer that I could not capture with my camera. This stamp set is retired, but one that I will never give up. I just find it so versatile. Supplies: Stamps – Hero Arts, Stampin’ Up!, paper – Papertrey Ink White, Stampin’ Up! 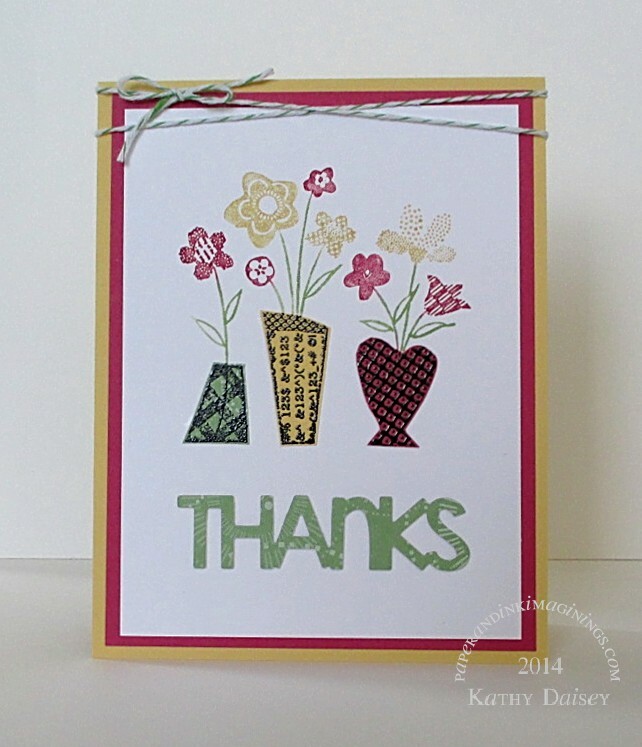 Pear Pizzazz, So Saffron, inks – Stampin’ Up! Calypso Coral, Chocolate Chip, Pear Pizzazz, So Saffron, VersaFine Vintage Sepia, Wink of Stella clear, die – Stampin’ Up!, washi tape – Stampin’ Up!, twine – We R Memory Keepers. 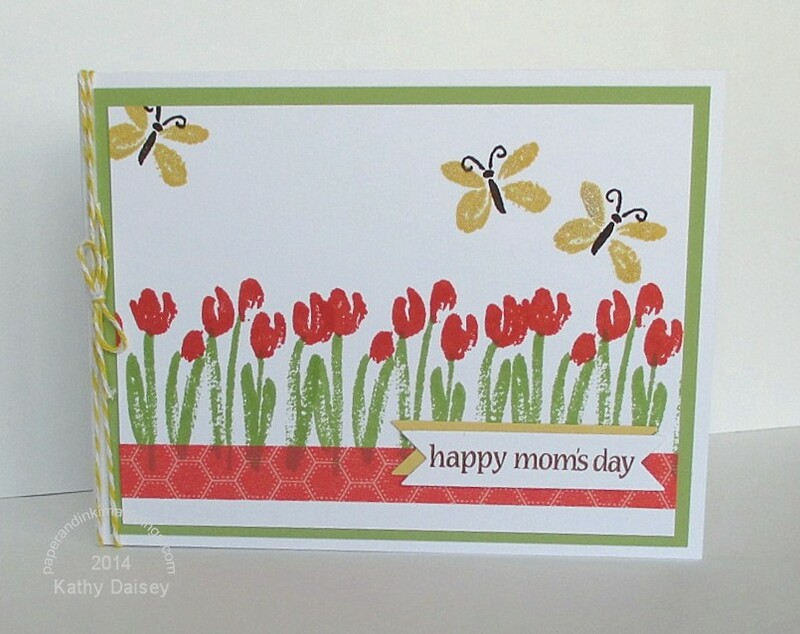 Categories: card, Mother's Day | Tags: card, Hero Arts, Papertrey Ink, PPA Challenge, Stampin' Up!, We R Memory Keepers | Permalink. 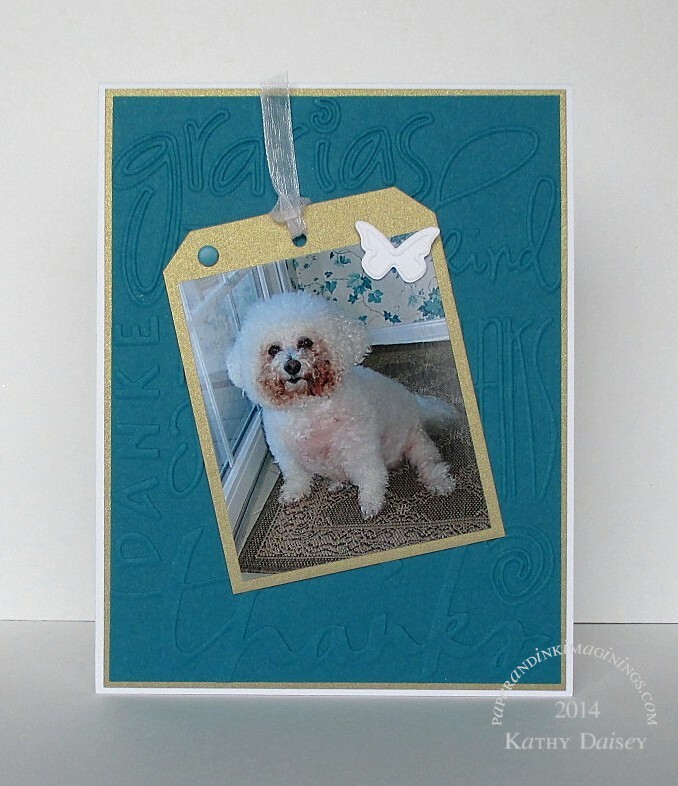 Today’s card is for the latest Pals Paper Arts Challenge (PPA196). I was in the mood for a pattern in the style and colors of Lily Pulitzer, and my Orchid Opulence ink pad was in my line of sight as I started on this challenge. Supplies: Stamps – Stampin’ Up!, paper – Stampin’ Up! Gable Green (retired), Orchid Opulence (retired), Shimmering White, Whisper White, inks – Stampin’ Up! 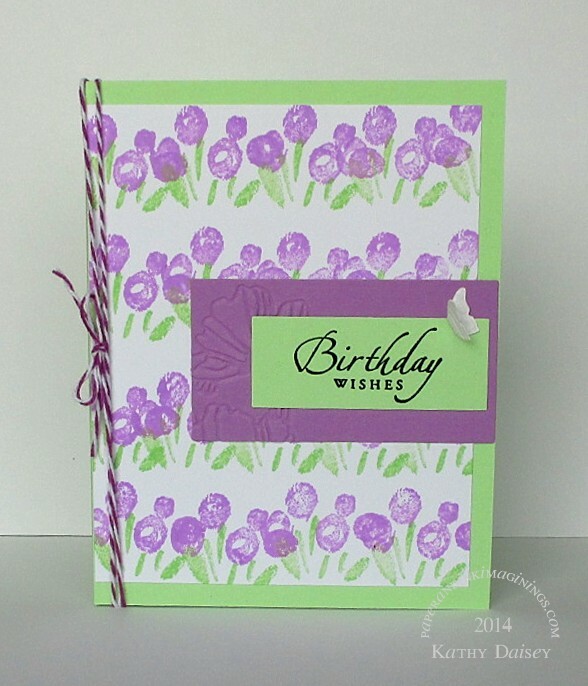 Green Galore (retired), Orchid Opulence (retired), VersaFine Onyx Black, dies – Spellbinders (rectangles), Stampin’ Up! (butterfly), embossing folder – Stampin’ Up!, embossing powder – Filigree Fine Art Powder clear, twine – We R Memory Keepers. Categories: birthday, card | Tags: card, PPA Challenge, Spellbinders, Stampin' Up!, We R Memory Keepers | Permalink. 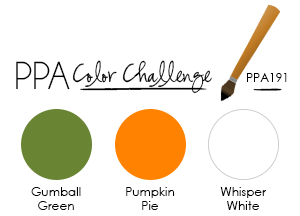 The latest Pals Paper Arts Challenge (PPA195) is a color challenge. The colors are Rose Red, So Saffron, and Wild Wasabi. I colored the stamp with markers, and stamped on the white cardstock. Then I stamped again with VersaFine Onyx Black on to the individual colors and embossed. I fussy cut the vases to paper piece onto the white layer. The “thanks” was die cut once out of Wild Wasabi, and twice out of my white scrap cardstock (Georgia Pacific, I get it at Sam’s Club). I glued all three layers together to give the word a little dimension. 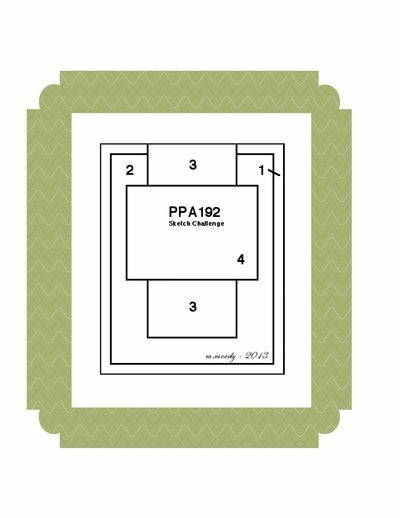 Supplies: Stamp – Stampendous, paper – Papertrey Ink White, Stampin’ Up! designer scrap (retired – only scrap of Wild Wasabi I could find), Rose Red, So Saffron, inks – Stampin’ Up! Rose Red, So Saffron, Wild Wasabi, VersaFine Onyx Black, die – Taylored Expressions, embossing powder – Filigree Fine Art Powder clear, twine – Martha Stewart. Categories: card, thanks | Tags: card, Martha Stewart, Papertrey Ink, PPA Challenge, Stampendous, Stampin' Up!, Taylored Expressions | Permalink. I worked the current Pals Paper Arts Challenge (#192) and the Simon Wednesday Challenge together this week. The Simon Wednesday theme is “wedding or anniversary” this week. And the tin ceiling designer paper was just perfect. I really like the white and the off white together. 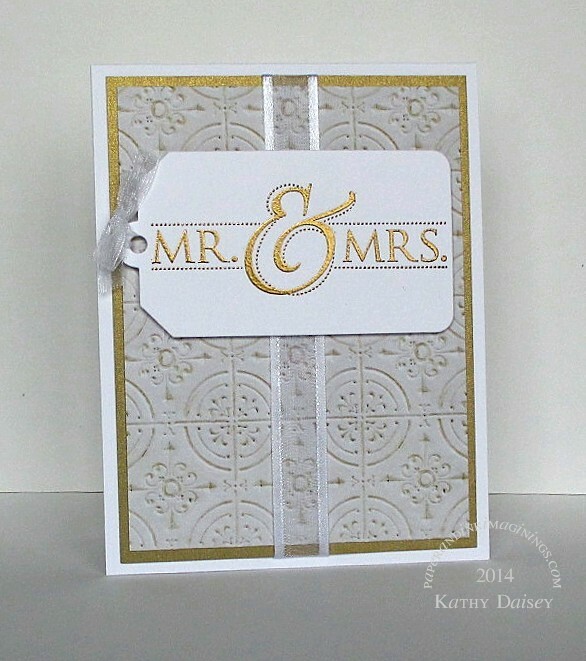 Funny, I had forgotten how much I LOVE gold embossing. Supplies: Stamp – Stampin’ Up!, paper – Papertrey Ink White, Stampin’ Up! Brushed Gold, Webster’s Pages – Alison Kraft, ink – VersaFine Onyx Black, die – Lawn Fawn, embossing powder – Stampin’ Up! Detail Gold, organdy ribbon – JoAnn’s, oragandy and satin ribbon – ClearBags. Categories: bridal/wedding, card | Tags: card, Lawn Fawn, Papertrey Ink, PPA Challenge, Simon Wednesday Challenge, Stampin' Up!, Webster's Pages | Permalink. I combined the latest Mojo Monday challenge (MOJO333) and the Pals Paper Arts Color Challenge (PPA191) today. 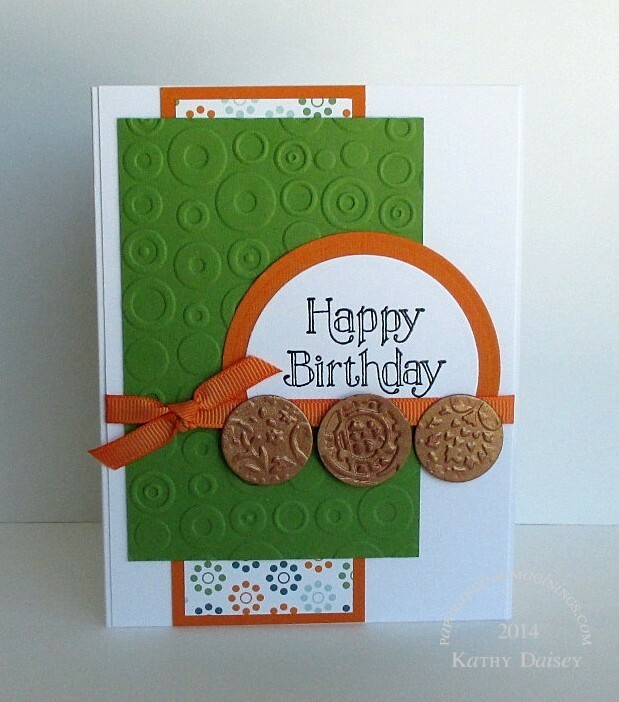 The MOJO sketch put me in the mood for circles, so I went all out – retired designer paper with circles, an embossing folder with circles, faux copper coins. Supplies: Stamp – Stampin’ Up!, paper – Papertrey Ink White, Stampin’ Up! Brushed Copper (retired), designer paper (retired), Gumball Green, Pumpkin Pie, ink – VersaFine Onyx Black, embossing folders – Provo Craft, dies – Spellbinders, embossing powder – Filigree Fine Art Powder clear, grosgrain ribbon – Stampin’ Up! (retired). Categories: birthday, card | Tags: card, Mojo Monday Sketch Challenge, Papertrey Ink, PPA Challenge, Provo Craft, Spellbinders, Stampin' Up! | Permalink. The current Pals Paper Arts color challenge (#187) is Real Red, Soft Sky, and Whisper White. I was inspired by a card that Nicole Heady posted this week, during Papertrey Ink’s January release preview. You can view the card here: Nicole Heady’s Birthday Wish Card January 2014. Happy Monday! Thanks for stopping by! Edited 1/15/14: Shut the front door! (in my best Stacy London voice) I got named one of the PPA Picks for this challenge. Thank you! Supplies: Stamps – Stampin’ Up! (the circles are retired), paper – Stampin’ Up! Real Red, Soft Sky, Whisper White, inks – Stampin’ Up! Real Red, Soft Sky, VersaFine Onyx Black, enamel dots – Stampin’ Up!, embossing powder – Filigree Fine Art Powder clear. 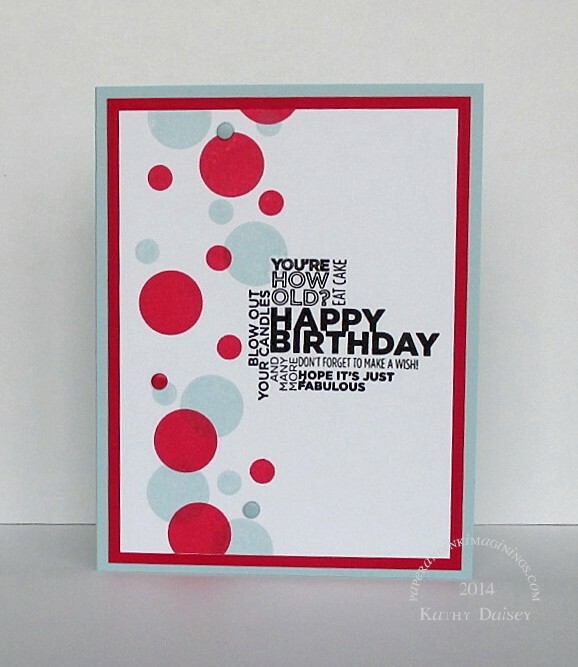 Categories: birthday, card | Tags: card, PPA Challenge, Stampin' Up! | Permalink. Pals Paper Arts posted their most recent color challenge (#186) just as I was starting on a thank you card to send to our very dear ex-neighbor (Good morning! I know you are reading with your coffee!) who moved away this past summer. I was already incorporating a photo of her dog, Josie (Josie has been gone a few years). Odd, you say, to include a photo of someone’s dog on a thank you card? The segue here is that Offspring3 and I were talking about how much we miss the neighbors that moved, and then, of course, how much we miss Josie (we dog sat, pinch hit whenever necessary). My friend gave me permission to use this image (I took the photo, but Josie was her dog!) here on my blog. The colors for the challenge are Island Indigo, Gold, and White. When I printed the photo of Josie (from 2009), the wallpaper really looked more Island Indigo than the actual green that it was in person. Supplies: Paper – Papertrey Ink White, Stampin’ Up! Brushed Gold, Island Indigo, embossing folder – Provo Craft, embossing/die (butterfly) – Stampin’ Up!, corner punch – Stampin’ Up!, enamel dot – Stampin’ Up!, organdy ribbon – JoAnn’s. 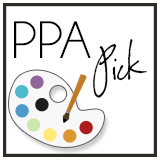 Categories: card, thanks | Tags: card, Papertrey Ink, PPA Challenge, Provo Craft, Stampin' Up! | Permalink.